Baruch Spinoza (or Benedict Espinoza or Bento Spinoza) (November 24, 1632 – February 21, 1677) was a Jewish philosopher and one of the first Jewish secularists. Spinoza was born to a Marano family in Amsterdam Holland. Fleeing the Spanish Inquisition, his ancestors had settled in Portugal, only to flee the inquisition when it came to Portugal and find shelter in Holland, along with numerous other Spanish and Portuguese Jews, the remnant of the glorious Jewish community that had once flourished in Spain under the Muslims. Spinoza's ancestors were Maranos who fled from Portugal to escape the Portuguese Inquisition and return to Judaism. They may have originally been Portuguese who migrated to Spain. Spinoza's father Miguel was born in the small Portuguese city of Vidigueira about a century after the forced conversion. Spinoza's grandfather, Isaac de Spinoza, took his family to Nantes in France, from whence they were expelled in 1615 and moved to Rotterdam. Isaac died in Rotterdam in 1627. Spinoza's father, Miguel, and his uncle, Manuel, then moved to Amsterdam where they re-assumed their Judaism openly. Spinoza's mother, Ana Debora, died when he was six years old. Spinoza initially received a traditional orthodox Jewish education, studying Talmud and Hebrew as a child and a young adult under Menasseh Ben Israel and afterwards under Rabbi Shaul David Morteira at the Keter Torah Yeshiva. At the same time, Spinoza apparently worked in his father's business. Miguel Spinoza died in 1654 when Spinoza when 22, and he and his brother founded a fruit export-import business. Spinoza came into contact with free-thinking' Protestants - dissenters from the dominant Calvinism – who maintained a lively interest in a wide range of theological issues, as well as in the latest developments in philosophy and science. This naturally included Cartesian philosophy. At the same time, Spinoza continued to study Jewish philosophers and religious thinkers such as Maimonides. He also began to study Latin and other subjects under an ex-Jesuit, Franciscus Van den Enden, who had recently set up a Latin school in Amsterdam. Van den Enden an excellent Latinist. He was also a medical doctor, scientist, and religious skeptic. "By decree of the angels and by the command of the holy men, we excommunicate, expel, curse and damn Baruch de Espinoza, with the consent of God, Blessed be He, and with the consent of the entire holy congregation, and in front of these holy scrolls with the 613 precepts which are written therein; cursing him with the excommunication with which Joshua banned Jericho and with the curse which Elisha cursed the boys and with all the castigations which are written in the Book of the Law. Cursed be he by day and cursed be he by night; cursed be he when he lies down and cursed be he when he rises up. Cursed be he when he goes out and cursed be he when he comes in. The Lord will not spare him, but then the anger of the Lord and his jealousy shall smoke against that man, and all the curses that are written in this book shall lie upon him, and the Lord shall blot out his name from under heaven. And the Lord shall separate him unto evil out of all the tribes of Israel, according to all the curses of the covenant that are written in this book of the law. But you that cleave unto the Lord your God are alive every one of you this day." We warn that none may contact him orally or in writing, nor do him any favor, nor stay under the same roof with him nor within four cubits in his vicinity; nor shall he read any treatise composed or written by him. The herem, or ban, was not an uncommon procedure. It was, it seems, an attempt to cope with the growing phenomenon of Jews, who, no longer subjected to the rigid rules of society prevalent in the Middle Ages, refused obedience to rabbinical authority, which could not be easily enforced. It may have been due to nervousness of the Ma'amad that the views of Spinoza would endanger the Jewish community. Similar views, such as Cartesian philosophy had been banned by the Christian community. The formula is not particularly original and is based on a stock formula of excommunication that appears in the book Kol Bo, a famous late 13th or early 14th century compendium of Jewish law. No specifics of Spinoza's conduct or teachings are cited as reasons for the excommunication. However, according to Inquisition spies, he was apparently guilty of questioning the immortality of the soul, he thought that Law was not true, and he though that God exists only philosophically. Rabbi Morteira, one of his teachers, was among the leaders of the Amsterdam rabbis who approved the excommunication decree. Menasseh ben Israel, another leading rabbi who would have had to approve the decree, was away in England, trying to negotiate the return of the Jews to that country. The Jewish community had no power to use force, unlike the Catholic Inquisition. Spinoza did not become famous until after death. When he did, the herem gradually became a matter of increasing shame for the Jewish community, especially as Jews emerged from rabbinical rule into the enlightened society of modern times. Spinoza was now no longer a Jew among Jews. Among non-Jews, he no doubt discovered that he was still a Jew. A letter of Antonie van Leeuwenhoek, takes note of Spinoza's activities as a lens grinder and refers to him as a Jew. Quakers William Ames and William Caton, who visited Holland or were in contact with an unnamed Jew who had been "cast out" of his congregation (apparently Spinoza) referred to this person as a Jew. It is not known if Spinoza's hobby or occupation of lens grinder, which he may have taken up at this time, was related to his excommunication. It is not true that he needed to grind lenses for a living, as friends provided for his living. He may have studied in the university at Leyden. There he would have received formal instruction in Cartesian philosophy and become familiar with the work of prominent Dutch Cartesians. In 1661, he settled near Leiden, in the town of Rijnsburg. Spinoza began his literary career in the late 1650s. His first work, the Treatise on the Emendation of the Intellect, tried to formulate a philosophical method that would allow the mind to form the clear and distinct ideas that are necessary for its perfection. His method was clearly based on Cartesian philosophy, but quickly departs from it in essentials. The work included, in addition, reflection upon the various kinds of knowledge, an extended treatment of definition, and a lengthy analysis of the nature and causes of doubt. The work was never finished. 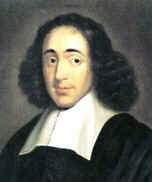 Shortly thereafter, while in Rijnsburg, Spinoza set to work on his Short Treatise on God, Man, and His Well-Being. This work, circulated privately among friends, foreshadows many of the themes of his mature work, the Ethics. Most notably, it contains an unambiguous statement of the most famous of Spinoza's theses - the identity of God and Nature. In 1663 he moved to the town of Voorburg, near The Hague, where he settled into a quiet, but busy, life. At the behest of friends, he immediately set about preparing for publication a set of lessons that he had given to a student in Leiden on Descartes's Principles of Philosophy. The result was the only work that he was to publish under his own name, now Latinized to Benedict: René Descartes's Principles of Philosophy, Parts I and II, Demonstrated According to the Geometric Method by Benedict de Spinoza of Amsterdam. Spinoza's friend, Lodewijk Meyer, wrote a preface, warning the reader that his aim was exposition only and that he did not endorse all of Descartes's conclusions. He also appended a short piece, entitled Metaphysical Thoughts, in which he sketched some of his own views. Spinoza's work on Descartes shows that he had an early interest in the use of geometric method in philosophy. In addition to putting parts of the Principles into the geometric mode of argumentation, he began experimenting with geometric demonstrations of material taken from his own Short Treatise. This provided the impetus for a fully geometric presentation of his thought. He began work on this sometime in the early 1660's, and by 1665 substantial portions of what was to become the Ethics were circulating in draft form among his friends back in Amsterdam. He suspended work on it, turning instead to a book that would prepare an audience receptive to the Ethics. This was the Theological-Political Treatise, which he completed and published anonymously in 1670. Spinoza's philosophy was rich, complex, and open to different interpretations. Spinoza argued that the stability and security of society is enhanced by freedom of thought, meaning primarily the freedom to philosophize. Europe was opting for state religions: cuius regio, eius religio each region having its own religion. Spinoza envisioned a secular state in which all religions were tolerated, and a state-enforced code of ethics. The Theological-Political Treatise, like much of Spinoza's writing about organized religion, may reflect in part his bitter aversion to organized religion due to the excommunication and to the persecution of his ancestors at the hands of the inquisition. He believed that the main threat to freedom of thought came from the clergy, whom he accused of playing upon the fears and superstitions of people in order to maintain power. His solution was to divest the clergy of all political power. The sovereign, Spinoza argued, should extend broad liberties, requiring adherence to no more than a minimal creed that was neutral with respect to the historical religions of competing sects. This creed was to be a mass product needed to preserve order and morality among the people, whereas only the intellectually sophisticated could really understand the subtleties of faith. The Theological-Political Treatise met with bitter criticism. It was condemned as a work of evil, and Spinoza was accused of having nefarious intent in writing it. Even some of Spinoza's closest friends were deeply unsettled by it. Though he had assiduously tried to avoid it, Spinoza found himself embroiled in heated religious controversy and branded an atheist. A deeply religious man in his own way, he deeply resented this label. In 1670, Spinoza moved to The Hague, where he remained for the last seven years of his life. Besides the clamor against his Theological-Political Treatise, he was affected by a political revolution that ended in the murder of the First Staadholder ("Grand Pensionary") of Holland, Jan De Witt and his brother, Cornelius, by an angry mob of Orangist-Calvinists. Spinoza admired De Witt, who was a liberal, and was appalled by the murder. With the ascent of the monarchist, Orangist-Calvinist faction, he felt his own situation to be uncertain. Nonetheless, Spinoza pressed on. He undertook new projects, including a Hebrew grammar, and he returned to work on the Ethics. By 1675 it was complete. However, given the icy reception of the Theological-Political Treatise, and the increasing intolerance of Dutch society, and as he perceived his enemies to have grown in influence and opportunity, Spinoza decided not to publish it in his lifetime. By this time Spinoza's health was failing. Weakened by a respiratory illness (possibly silicosis due to the lens grinding), he devoted the last year of his life to writing his Political Treatise. It was left incomplete at his death. Spinoza's intention was to show how governments of all types could be improved and to argue for the superiority of democracy over other forms of political organization. Following the lead of Machiavelli and Hobbes, his argument was suupposedly based on a realistic assessment of human nature drawn from the psychological theory of the Ethics. The completed portion showed Spinoza to be a competent analyst of diverse constitutional forms and an original thinker among liberal social contract theorists. Spinoza died in his rented room in The Hague in 1677. The manuscripts of his unpublished works - the Treatise on the Emendation of the Intellect, the Ethics, the Hebrew Grammar, and the Political Treatise were found in in his desk. They were immediately shipped to Amsterdam for publication, and in short order they appeared in print as B.D.S. Opus Posthuma. Predictably, in 1678, these works were banned throughout Holland. Spinoza pioneered secular philological criticism of the Bible and advanced a unique theological and ethical philosophy that was complex and easily given to misunderstanding. His ideas inspired diverse Jewish and non-Jewish philosophers and thinkers from Heine to Hegel and Schopenhauer, and from Bergson to Hess and Einstein. Bergson stated that every philosopher has two philosophies: his own and Spinoza's. Bertrand Russell called him "the noblest and most lovable of the great philosophers." The excommunication - herem was only lifted indirectly, by Rabbi Herzog, chief Rabbi of Israel, who decreed that the herem had only extended to those who were contemporaneous with him, and that subsequent generations could read his works. However, Spinoza is honored by numerous streets named after him in Israel, and his work generates a great deal of academic interest. In many ways, Spinoza was a precursor of the European enlightenment, and as such, a precursor of the Jewish enlightenment. Spinoza was the first Jewish thinker to envision the secular state, and by implications, the problems of identity that would arise for Jews who were not religious. As such, he made the idea of Zionism possible and provided a philosophical framework for secular, universalistic Judaism. Spinoza spurned what he called historical religion, and believed that the misadventures of the Jewish people were due to the vicissitudes of natural law, rather than the workings of the divine will. For that reason, he also envisioned the possibility that there could be a secular reconstitution of the Jews in their own state, without subscribing to Messianism. However, Spinoza did not take any stand on the desirability of restoration of the Jews. Spinoza's concept of God has often been mis-described as deism, theism or pantheism. Spinoza did not believe that God is a separate force from nature and above nature, or a God that is in everything. He believed that God is the sum total of the natural universe. This conception has been called immanence. 1660 or 1661. Korte Verhandeling van God, de mensch en deszelvs welstand (Short Treatise on God, Man and His Well-Being). 1663. Principia philosophiae cartesianae (Principles of Cartesian Philosophy, translated by Samuel Shirley, with an Introduction and Notes by Steven Barbone and Lee Rice, Indianapolis, 1998). Gallica. 1677. Ethica Ordine Geometrico Demonstrata (The Ethics) Project Gutenberg. Another translation, by Jonathan Bennett. Etienne Balibar, 1985. Spinoza et la politique ("Spinoza and politics") Paris: PUF. Jonathan Israel, The Radical Enlightenment, Oxford: Oxford University Press, 2001. Stoltze, Ted and Warren Montag (eds. ), The New Spinoza (Minneapolis: University of Minnesota Press, 1997.